Peter Salerno Inc., Miele Partner to Create Design Showroom Vignette – Design Your Lifestyle. Over the last 30 years, Peter Salerno Inc. has forged business relationships with the foremost design and appliance firms around the world. Now, Peter Salerno and his team are proud to add Miele to that list. 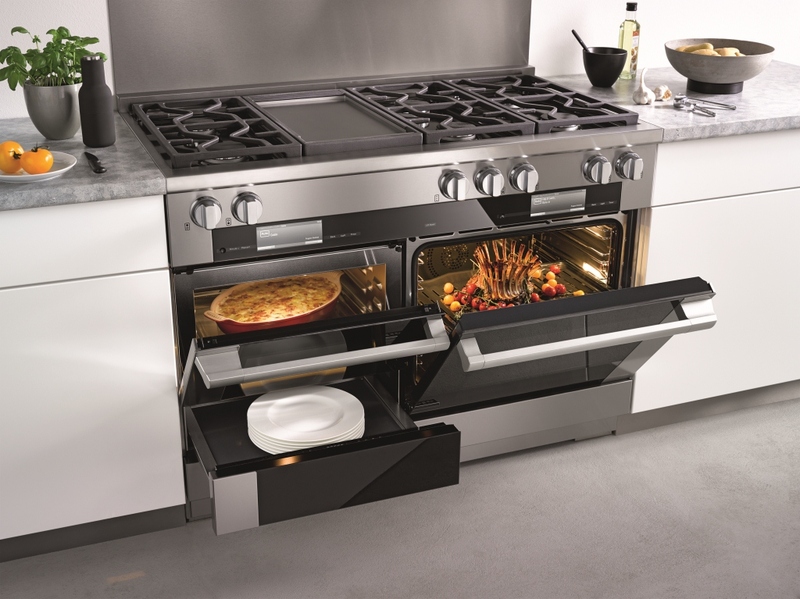 The streamlined, revolutionary 48″ Miele dual fuel range. Over the next few weeks, Peter Salerno Inc.’s showroom will undergo a transformation – a brand new vignette, featuring some of the most revolutionary kitchen appliances you have ever seen. It’s only right that the Most Innovative Small Showroom of 2015 keeps up with the most innovative, sleek and functional product lines on the market in their vignettes and displays – and in the case of Miele’s 2015 product line, the choice was easy. The centerpiece of the new Peter Salerno Inc. Miele kitchen vignette will undoubtedly be the new Miele 48″ dual fuel range. After spending over 7 years in research and development, one would assume the resulting range would be nearly flawless. And that’s pretty much the case. With a streamlined 3-door concept, 30″ wall steam assist, speed oven/microwave combo and plumbed-in steam assist, it’s one of the most beautiful and functional ranges in the world. 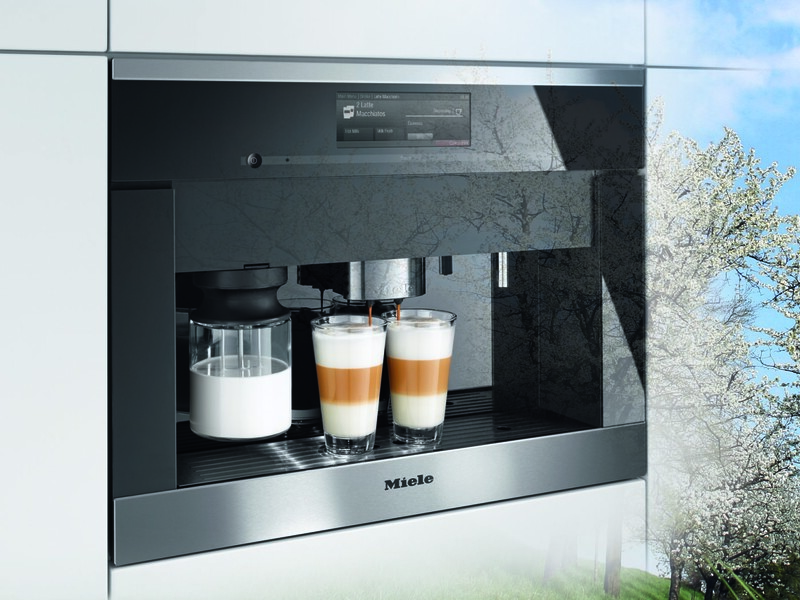 The Miele Generation 6000 coffee maker. Combine that with the new Miele coffee maker, with swipe intuitive interface, user-friendly streamlined design, automatic adjustable-height dispenser, on-board milk steamer and M class control, and you have the foundation for perhaps the most revolutionary transitional kitchen showroom display in the world today. Over the coming weeks, Peter Salerno Inc., Miele, and boutique appliance studio Oberg & Lindquist will bring you a series of reports, appliance overviews, updates and sneak previews of the new Peter Salerno Inc. showroom vignette. Together, we will show you why Miele’s motto truly is Immer Besser: “Forever Better”. Pingback: Presenting the Miele Generation 6000 Coffee System [PHOTOS] | Peter Salerno Inc.
Pingback: Peter Salerno Visits Miele Showroom in Princeton, NJ [PHOTOS] | Peter Salerno Inc.